The Men’s DVD presents all of the Bodybuilding Classes of the 2017 ARNOLD AUSTRALIA MEN’S AMATEUR. See all of the lineups, posing, key comparisons, callouts and all awards, plus the OVERALL AWARDS presented by Arnold, plus the awarding of Pro Cards. 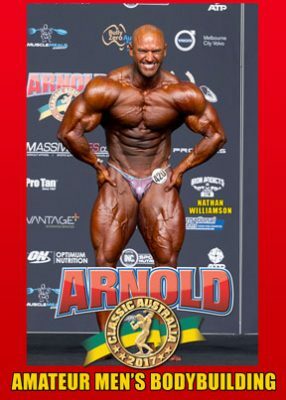 The first of two Men’s DVDs presents all of the Bodybuilding Classes of the 2017 ARNOLD AUSTRALIA MEN’S AMATEUR. See all of the lineups, posing, key comparisons, callouts and all awards, plus the OVERALL AWARD to Nathan Williamson presented by Arnold, plus the awarding of his Pro Card. If you prefer, you can purchase your own class, and have the edited Video File sent to you by a free video transfer service. A File includes the complete class through to the awards. If you are a class winner in an overall posedown this will be included in your file. Order the VIDEO FILE HERE, GMV-955VF. 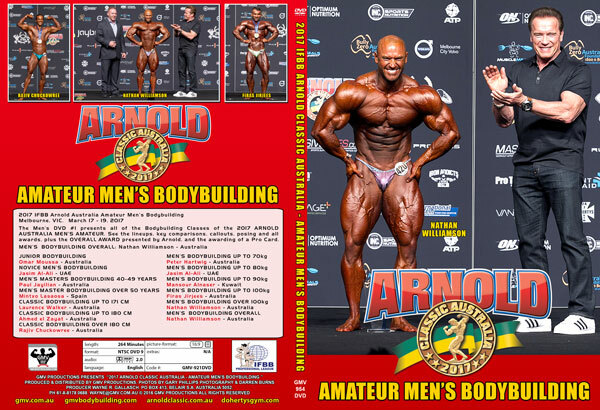 Photos: Gary Phillips Photography, Darren Burns & the Arnold Classic Photography team. March 17-19, 2017 Melbourne, VIC. If you see any typos in these names, please email me at wayne@gmv.com.au and I will correct it.